Please remember that when I am reviewing scents, it’s based on my opinion and my opinion only. Scared?? Well, I wanted to get in this review quickly after finally getting home from being out all day so I could wash this off my skin and put on something else. I received this sample a few weeks ago and thought I would give it a spin. Have you figured out yet that it’s not my favorite? At it’s base, this perfume is amber, but you can’t really tell that it’s so. The juniper when first applied is all that you smell. Very green, very crisp. As time goes on, this mellows into a very light and green clean scent. And when I say clean, I mean it felt to me as if I just got out of the shower and you could still smell the soap. It has a bit of a soapy edge to me. I don’t want to feel like I’m wearing laundry detergent. This scent reminds me a lot of Mirto di Panerea, one of the fragrances in the Blue Mediterraneo line by Acqua Di Parma. They both share a lot of the same ingredients. Neither are for me. Enough said, time to wash up. Tolu is a Peruvian tree resin. 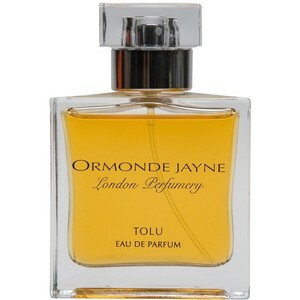 Categories: Ormonde Jayne | Tags: 2 bones, amber, Feminine, light, oriental, Ormonde Jayne, review, Tolu | Permalink.